Kritika Soni makes beautiful ceramic home decor inspired by the Japanese philosophy of Kara Sabi that celebrates imperfection and impermanence. This is why all her vessels, trinket dishes and wall art are proud to be flawed – and that’s exactly what makes them so charming. 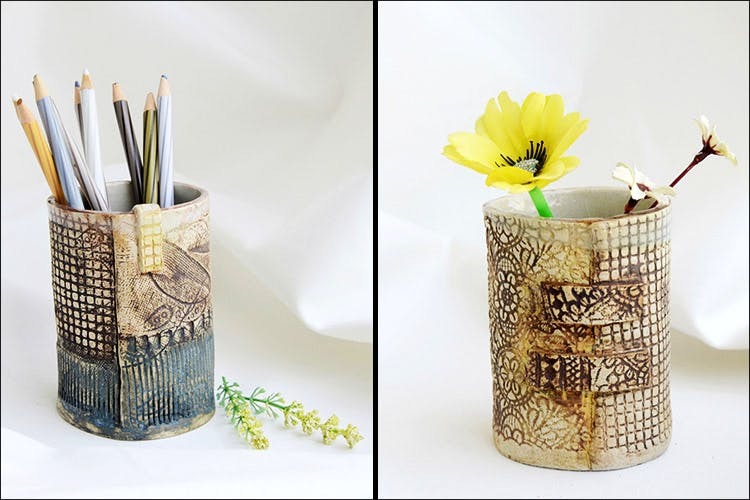 Kritika holds a degree in textile design but has sworn eternal love to ceramics. We love that she embraces the process of ageing and turns it on its head to prove that beauty indeed lies in things that aren’t forever. At Kara Sabi, she’s all about subtlety and an understated palette. So if you seek bright and kitsch, look elsewhere, guys. Instead of ironing out the creases, she actually allows them to tell their own story. The many cracks and varied textures find all the love in her creations and we don’t get to complain when everything looks as gorgeous as it does here. This mug, for instance is where our pens and buds will take turns. We even found a trinket dish that will gladly keep the tiny silver earrings we keep shoving in our overstuffed pouches and our walls… they can do so much better than paintings we’ve never understood – this wall art, seems like a great replacement for now. White walls, fairy lights and a few of these ceramic pieces… That’s how we’re going to create our happy reading corner.